Further damage has affected the Transat Jacques Vabre fleet with a further four boats having recently signalled that they intend to make technical stops. 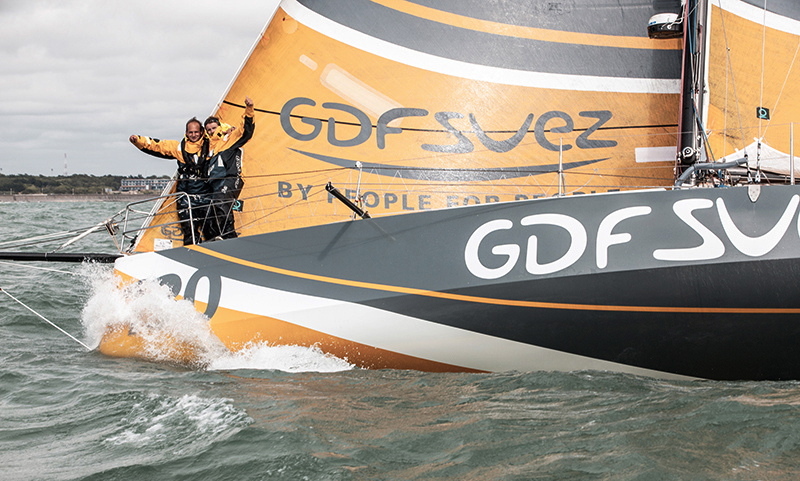 There are three Class 40s, GDF SUEZ, Tales Santander 2014 and 11TH Hour Racing and the Multi 50 Actual. 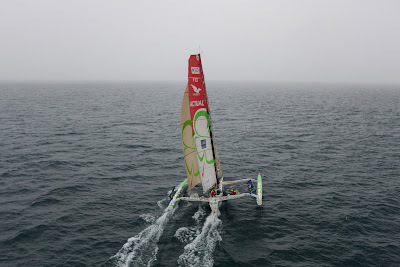 Not long after they left Roscoff in the lead of the Class40 fleet on Sunday morning at 0400hrs (CET/France) French duo Sébastien Rogues and Fabien Delahaye realised they had lost the two essential wind vanes off the top of their mast. The pair plan to make an express pit-stop on the Spanish coast to make a rapid repair. On the 1400hrs (CET) position report this afternoon they lead the class by 18 miles this afternoon. Class leaders of the Multi 50s, Actual, sailed by Yves Le Blévec and Kito de Pavant have confirmed that they have decided to make a technical stop in Madeira which lies 160 miles away pretty much on their direct course. They plan to re-instal part of their wind instrumenta at the top of the mast. Ronan Deshayes, technician, will be in situ to help. The stop is also expected to be a short one. On the 1400hrs ranking this afternoon Actual were leading by 39 miles ahead of FenêtreA-Cardinal (Erwan Le Roux/Yann Eliès). Spaniards Alex Pella and Pablo Santurde on the seventh placed Class 40 Tales Santander 2014 have indicated they plan to stop into La Coruna after their starboard rudder took a shock, damaging the bearing. The two Spanish sailors believe they should reach La Coruna tomorrow but cannot anticipate how long the repair might take. And Transat Jacques Vabre race direction received confirmation from Hannah Jenner (GBR) and Rob Windsor (USA) that they will head to Brest after damaging their forestay where they will make a full assessment. Jenner reported, "At 0945 UTC this morning we were sailing upwind in 16-17 knots when there was a loud bang. Our forestay has detached at the top of the mast dropping the Solent (headsail) into the water. We have recovered the sail and saved the rig. We are headed back towards Brest where we will make a final decision on our race status." Brest is approximately 150nm NE from their last reported position.